Earlier this month, I had the opportunity to take a look at an early copy of the newly released cookbook, Sugar-Free Mom, by food blogger, Brenda Bennett. After launching a successful food blog of the same name – Sugar-Free Mom – in 2011, it didn’t take long to realize that there was a big audience out there for sugar-free recipes. Brenda creates breakfasts, breads, dinners, desserts, and more, using sugar-substitutes such as stevia or sweeteners with a lower glycemic index such as coconut palm sugar. The results are tasty. Her recipes are not too difficult to follow and, if you are lucky enough to have a local health food store or a Whole Foods nearby, most ingredients are readily accessible without searching them out online. An added bonus for me, as a mom who cooks gluten-free, Brenda’s recipes are almost all grain-free or gluten-free! If you are able to eat and cook with gluten, there are notes about converting recipes to use more traditional wheat flour, if desired. If you take a quick look through my recipe archives, you might notice that when I bake, I might not use wheat flour, but I definitely use sugar. I have never had a problem with cooking with sugar, eating sugar, or feeding it occasionally to my children … until this year. A few months ago, about halfway through the pregnancy of my 5th child, I discovered that I had gestational diabetes. After trying to control it with diet and exercise, my doctors quickly realized that I would be needing insulin, day and night, in addition to keeping close tabs on everything I put into my mouth. To say that trying to get through the holiday season stretching from Thanksgiving to New Year’s without sugar was a challenge would be a huge understatement. Cutting out sweet potatoes, white potatoes, rice, fruit, and, of course, cookies, cakes, and pies, was such a blow. I am always the first person to volunteer to make a cake or a pie (or 5 pies), so to have such strict limitations on my dessert making and dessert consumption was crushing. When I had the opportunity to get an early copy of Sugar-Free Mom, I jumped at the chance to get some new ideas. As I looked over Brenda’s new cookbook, I knew that I wanted to test some recipes that my kids would really appreciate – mainly something sweet and dessert-like. One of the things that I love about the Sugar-Free Mom cookbook is that it has a wide array of recipes. Do you want dinner? An appetizer? A snack? This cookbook has got you covered. 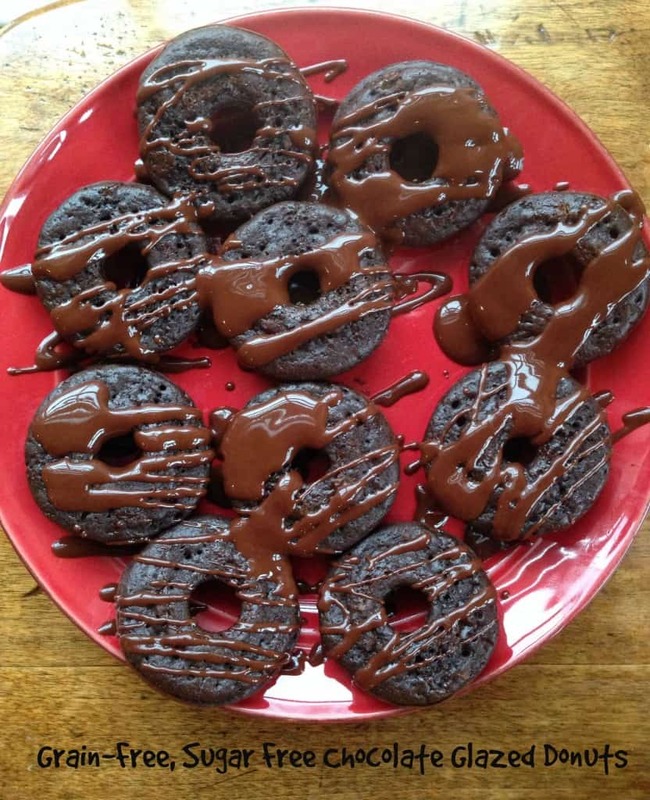 When my kids saw the photo for the grain-free chocolate glazed donuts, they begged me to give those a try. How could I say no? With fewer than 10 ingredients, a few minutes to mix together and fifteen minutes in the oven, this recipe is just my style. For more delicious, sugar-free recipes like this one, you will need to get your hands on Brenda Bennett’s new cookbook (available online at Amazon) … And be sure to check out Sugar-Free Mom online! 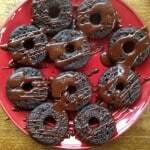 An easy grain-free, sugar free recipe for chocolate glazed donuts! Pour into greased donut pans (I sprayed my pans with coconut oil spray). Melt glaze ingredients in the microwave at half power for 30 seconds. Stir until chocolate is melted. Drizzle over warm donuts. Makes 9 large donuts or 18 medium sized donuts.